Friends of Slow Money are at it…..
Are you fighting to protect the environment? Mitigate climate change? Save the oceans? End oil dependency? Improve health? Improve food systems? Preserve freedom? Imagine if your $5 contribution (coupled with thousands of others) could launch a whole new movement — one that fixes our food system, empowers social entrepreneurs and begins healing our economy, all at the same time? Make your $5 donation now-click on the “chip in” widget just next to the video. Learn more about how the Slow Money philosophy affects today’s most critical issues. The Slow Money Conference last month was truly inspirational and it brought together over 450 motivated attendees from across the country and around the world, to take action NOW. 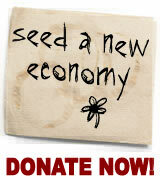 This call to action by the Friends of Slow Money is an example of how each of us can make a difference. 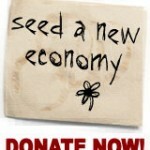 Donate five dollars to help fund a movement whose goals are supporting sustainable agriculture, creating global food security, protecting our environment and so much more. What can you do in your daily life to bring about these important goals? be considerate of those around you…what is the point of saving the planet if you can’t say hello to your neighbor or co-worker? when we start caring more about those around us we will become more aware of how all of our actions impact others, close by and far away. To learn more about the Slow Money movement this link will take you to the book Slow Money where you can order a copy from an Independent book store.